In an extraordinary set of tweets aboard Air Force One, on its way to Singapore for next week’s summit with North Korea’s Kim Jong Un, Trump lashed out just as Canada released the G7′s official communique. 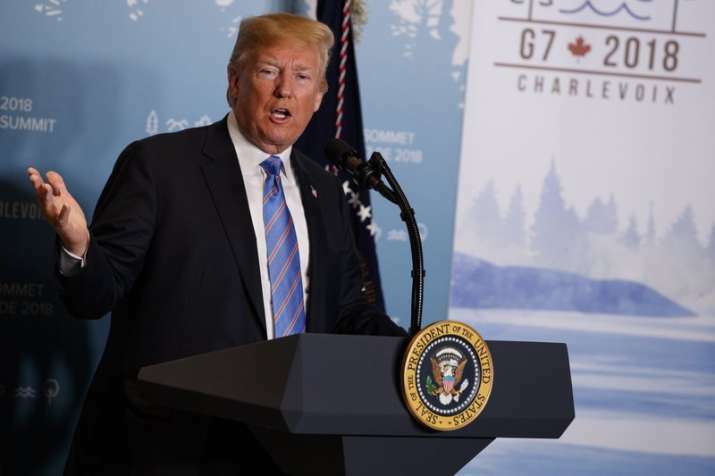 United States President Donald Trump has withdrawn his endorsement of a joint statement at the end of a G7 summit in Canada in a row over trade, accusing the summit's chairman Justin Trudeau of dishonesty. 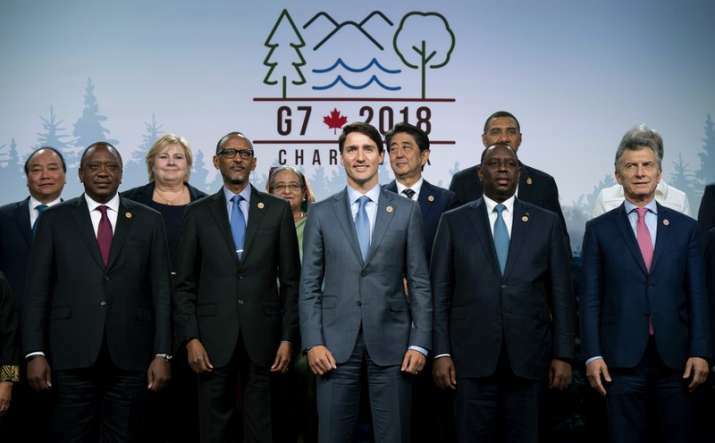 Trump threw the G7 summit into disarray by tweeting that Canadian Prime Minister Justin Trudeau is “dishonest & weak” and that the US was pulling back its endorsement of the group’s communique in part because of what he called Trudeau’s “false statements” at a news conference. In a set of tweets moments after leaving the G7 Summit early, Trump lashed out just as Canada released the G7′s official communique. Its statement took a generally positive view of the leaders’ positions on trade matters while acknowledging tensions with the US. Trump is on way to Singapore for next week’s summit with North Korea’s Kim Jong Un. As he exited the world summit, Trump had delivered a stark warning to America’s trading partners not to counter his decision to impose tariffs on steel and aluminum imports. But the summit host, Trudeau, whose nation was among those singled out by Trump, pushed back and said he would not hesitate to retaliate against his neighbor to the south. “If they retaliate, they’re making a mistake,” Trump declared before departing the annual Group of Seven summit, which includes Britain, Italy, France, Germany and Japan. 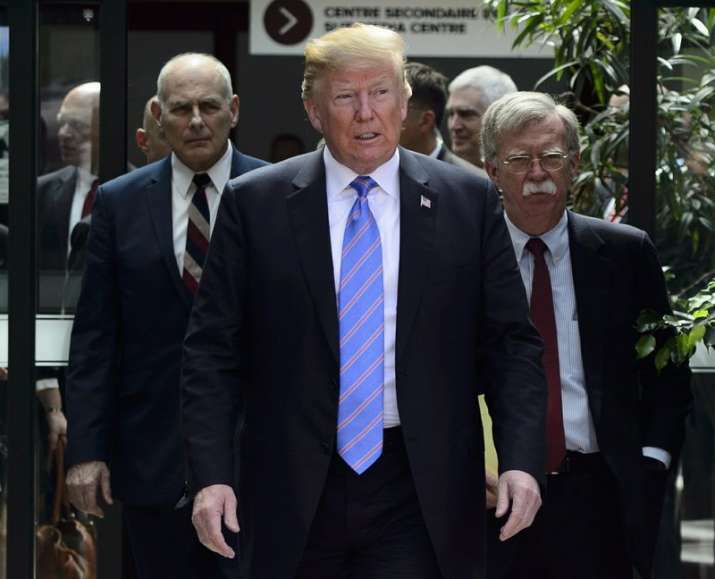 US President Donald Trump leaves the G7 Leaders Summit in La Malbaie on Saturday, June 9, 2018., with White House Chief of Staff John Kelly, left, and National Security Adviser John Bolton. He said US farmers had been harmed by tariffs and other barriers and warned that US trading partners would need to provide him with more favorable terms. “It’s going to stop or we’ll stop trading with them,” he said. Trump cited progress on reaching an agreement on the North American Free Trade Agreement with Canada and Mexico, saying the final outcome would lead either to an improved trade deal or separate pacts with the two US neighbours. Trump said he was discussing two types of sunset provisions in which any of the countries could leave the deal. A Canadian official said the leaders discussed accelerating the pace of the talks. But Trudeau objected strenuously to a sunset clause of any length. “If you put an expiry date on any trade deal, that’s not a trade deal. That’s our unequivocal position,” he said. Prior to his arrival on Friday, the president injected additional controversy by suggesting that the G7 offer a seat at the table to Russia, which was ousted from the group in 2014. Trump said Saturday that re-admitting Russia to the elite club would be “an asset,” telling reporters, “We’re looking for peace in the world.” Trump said he had not spoken with Russian President Vladimir Putin in a while. Trump departed the annual G7 gathering after arriving late to a breakfast on gender equity and skipping later sessions on climate change, clean energy and ocean protection. 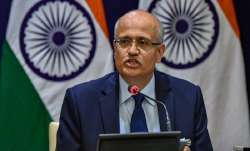 A key question was whether the seven countries could agree on a joint statement of priorities at the conclusion of the meeting. Macron said Thursday on Twitter, “The American President may not mind being isolated, but neither do we mind signing a 6 country agreement if need be.” Trump said Friday he thinks the group will produce a joint statement. In public, Trump bantered easily with his fellow leaders, but the meeting came at a tense moment in the relationships, with allies steaming over Trump’s new tariffs on imported steel and aluminum from Canada, Mexico and the European Union. Macron said he and Trump had “open and direct” discussions, adding that he thought there was a way to get a “win-win” outcome on trade. Details remained unclear.